Be sure to visit the website and Facebook page of our mates at Glasgow Parkour Coaching, for information on the classes they run, women only and mixed, outdoor and in. While you’re at it, check out Zeno’s tumblr, for some ace photos. 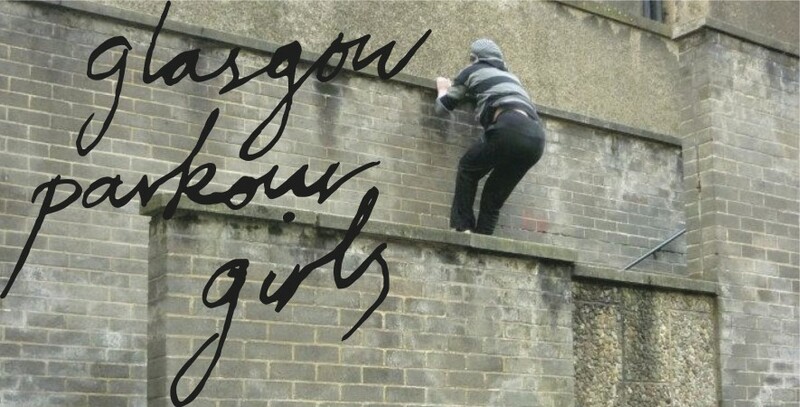 Glasgow Parkour Girls is proud to host the UK’s first women’s parkour event. To find out more details, keep an eye out on the Clamjamfrie blog. Click here to buy tickets, t-shirts or jumpers. As far as we are aware there aren’t many women’s only parkour classes in Scotland. However there are plenty of mixed classes and jams going on at which girls are of course welcome. There is a facebook group for Scottish parkour women (please only join if you are a woman interested in parkour in Scotland). This is an organisation that promotes and supports Parkour across Scotland, so visit their website and like the Facebook page too. Every year they run Scotland’s largest national gathering, also called Roots of Movement. A sport or athletic activity in which the participant seeks to move quickly and fluidly through an area, often an urban locale, by surmounting obstacles such as walls and railings and leaping across open spaces, as in a stairwell or between buildings.